Please click here if you would like more information on Agricultural Assessments. Wyoming County has long recognized the importance of agriculture. To place additional protection on our valuable agricultural lands, the first agricultural district was created in 1975 in Wyoming County. The County currently has 4 separate agricultural districts, which cover approximately 250,000 acres or about 2/3 of the County. These districts consist of viable agricultural lands, or, in other words, lands that are currently used for agriculture or may be used for agriculture in the future. Therefore, agricultural districts may include not just farm fields, but also residential, forested and commercial properties. The agricultural districts are not permanent, but instead change through time. Every 8 years, the County reviews each district and the Board of Supervisors decides whether to continue, terminate or modify the district. In the past, some districts have been merged together, which is why there is no current Ag District 1. Individual parcels are also added and removed from the districts during this 8-year review process, so the districts better reflect current land use. Finally, property owners may request to have their parcels added to an agricultural district during the Annual Review, which takes place from December 1st to December 30th in Wyoming County. The Annual Review is open to any of the agricultural districts in the County, so the districts may change even on a yearly basis. Limits to Local Regulation – Local governments cannot enact any rules or regulations in agricultural districts that are overly burdensome to agriculture, making it difficult or impossible to continue with agricultural production. Limits to Publicly Funded Construction and Eminent Domain Projects – If a governmental agency would like to perform certain construction activities or would like to acquire agricultural lands in an agricultural district, they must first go through a formal review process to determine the impacts of agriculture. A process is in place if unreasonable adverse impacts to agriculture would occur. Limits to Local Benefits Assessments – Local governments cannot charge benefit assessments, special ad valorem levies or other rates or fees to lands used primarily for agricultural production within an agricultural district. Discouragement of Private Nuisance Lawsuits – Property owners are notified at the time of sale that their property is within an agricultural district. Additionally, the State will determine what is considered a “sound agricultural practice.” Sound agricultural practices cannot be considered a nuisance on lands within an agricultural district or on lands receiving an agricultural assessment. Consider Agricultural Impacts by All State Agencies – The Agricultural District Law ensures all State agencies seek to protect viable farmland. 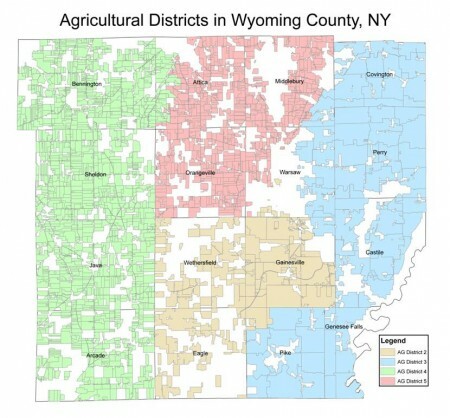 Right now, you will have to call Wyoming County Soil and Water Conservation District to determine if you are in an agricultural district or you may visit the NYS Ag and Markets website to see a general agricultural district map. In the near future, this information will also be included on the Wyoming County Real Property Web Mapping. Counties are also required to designate an annual 30-day period when landowners may petition the County for inclusion of viable agricultural lands in an existing agricultural district. In Wyoming County, the annual review takes place from December 1st to December 30th each year. You can find an application here. The Department has developed guidelines on the effect of ADL §305-a on enactment and administration of local laws and regulations. These documents are updated periodically and may be obtained from the Department’s website or by contacting NYS Ag and Markets. Government actions may impact farms and agricultural resources through the acquisition of property interests or funding of infrastructure development, such as sewer and water lines. The ADL (§305, subd. 4) requires that State agencies, local governments and public benefit corporations which intend to acquire more than one acre of land from any active farm within an agricultural district or more than 10 acres in total from a district, must file a notice of intent with the Commissioner at least 65 days prior to taking the action. Similarly, a notice must be filed for all actions where the government sponsor intends to advance a grant, loan, interest subsidy or other form of public funding for the construction of dwellings, commercial or industrial facilities, or water or sewer facilities to serve non-farm structures within an agricultural district. The notice requirement does not apply in the case of an emergency project which is immediately necessary for the protection of life or property. Agricultural District Law attempts to discourage private nuisance lawsuits in two different ways. First, the Commissioner may, in consultation with the Advisory Council on Agriculture (ACA), issue opinions upon request as to whether a particular agricultural practice is sound (ADL §308). A sound agricultural practice (SAP) refers to the practices necessary for the on-farm production, preparation, and marketing of agricultural commodities. An agricultural practice conducted in an agricultural district or on land receiving an agricultural assessment shall not constitute a private nuisance provided that the practice is determined to be an SAP pursuant to an opinion of the Commissioner. The Commissioner is also authorized, in consultation with the ACA, to issue advisory opinions on a case-by-case basis as to whether particular land uses are agricultural in nature.